Technical Pro knows that sometimes you need power AND a stylish design to your speaker system. If you are setting up for a large venue or need big power out of your speakers but still want to maintain a stylish stage or studio presence with your gear, the Xtreme series is for you! The Xtreme1501 is a Carpeted 15" Powered Subwoofer. This speaker is for anyone looking to beef up their low end and achieve a thunderous low frequency output from their speaker system. This speaker is for top level professional use! The Xtreme1501 has a total peak power of 1500 watts. This is the type of power you need for a large sized venue such as a live stage show, large studio space, showroom or in a nightclub. 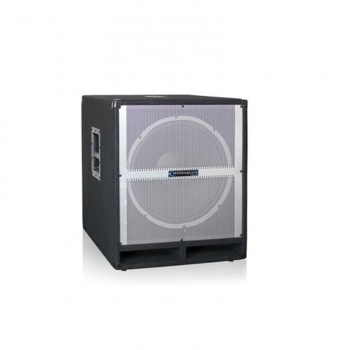 This subwoofer is an ACTIVE speaker which means you do not need any additional amplifier to power this speaker. The system comes complete with a satellite amplifier that can power two up to two additional loudspeakers. Use this amplifier to power additional satellite speakers orbiting the subwoofer! The inputs are ¼” and XLR. Connect any standard playback devices or mixer to this connection and send your source through one of the best subwoofers on the market! The passive pass-through outputs of the subwoofer are ¼” and XLR. Use these pass-through outputs to send the signal to another power subwoofer. Using the outputs of the satellite amplifier you can choose between two speakon and two banana connections. You can use these outputs to power two other satellite speakers! The woofer is 15” with a massive 90oz. magnet and 3” voice coil. This will deliver a clear translation of booming low end frequencies. There are separate volume controls for the subwoofer and the satellite speaker connections. This is key if you need to balance out your levels between the low frequencies coming out of the subwoofer and the mid/high frequencies coming out of the satellite speakers. Also inside you will find a switchable high pass filter for the satellite connections. If you are sending your whole signal into the subwoofer use the high pass filter.this will send the low frequencies to the booming subwoofer and the high frequencies will pass through to the mid/high satellite speakers. This is a professional set up meant to properly send your frequencies to the proper speakers! Technical Pro Powered Subwoofers are designed specifically for club and high-end pro audio users. The heart of the system is a massive driver of 12", 15" or 18" ideal for the most demanding environments where pure bass power is the goal. They produce amazing new levels of bone-jarring bass, making Technical Pro Subwoofers a superior choice for anyone looking for thunderous lows in large venue environments. The XTREME subwoofers have a built-in amplifier putting all of this power into one convenience box. Moreover, their powered speaker outputs and power up to two more speakers. The switchable high pass crossover allows for the satellite speakers to provide the mids and highs to complement the bass of the XTREME.